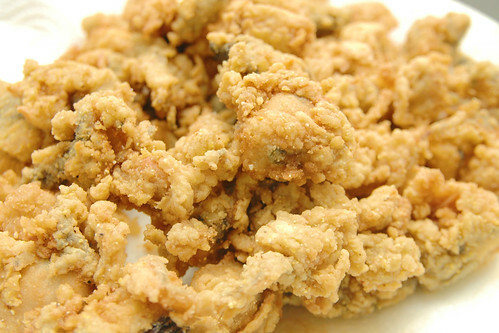 recipe: new england fried clams. it’s something of a birthday tradition for kris to get some clams flown in from main for my birthday and this year was no exception. two pounds of clams arrived at our house the day before my birthday from simplylobsters.com in lewiston, maine which is sort-of close to my ancestral homeland in and around machias, maine which is way, way, waaaaaaay down east. typically i make steamed clams because, well, there are few things better than a perfectly steamed clam dunked in broth and slathered in butter! but this year i thought it’d be fun to try my hand at fried clams because if there is one thing better than a steamed clam, it’s a fried clam! first, shuck the clams if they didn’t arrive already shucked. don’t cut yourself! it’s super important to tap the foot of the clam before shucking and discard any clams that remain open or don’t respond when tapped! 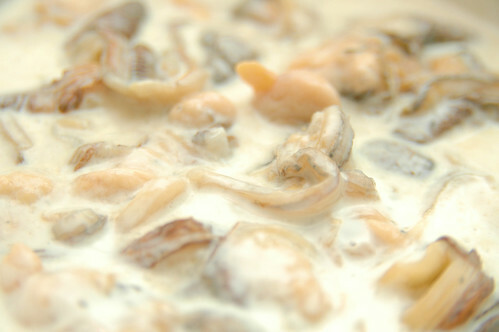 rinse and drain clams colander and stir together with *cough* organic valley buttermilk *cough* in a large bowl ( o.k. yes, i work for organic valley and am perhaps a bit biased but seriously, this is no time to go for a lesser quality ingredient 🙂 let sit while you prepare the rest of the ingredients and heat the oil to 380°F or so. combine the flours, salt, and and black and cayenne peppers in a largish mixing bowl or pie plate. you want something big enough to dredge clams through. 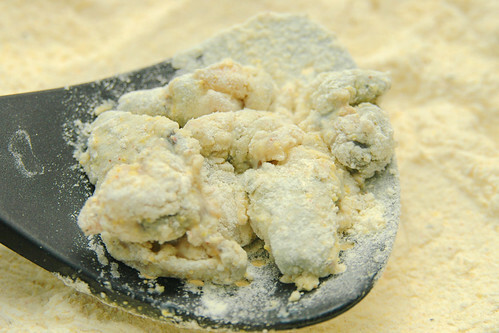 using a slotted spoon or whatever you have that will allow the excess buttermilk to drip away without allowing the clams to fall back into the bowl. 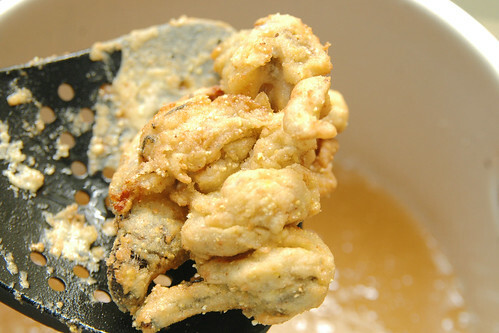 then, pick up a few clams, let the excess buttermilk drip off, and dredge them through the batter mixture. move them about to coat evenly. shake off the excess breading and dunk them the fryer. let them cook for a 20 seconds or so before disturbing so the breading had time to adhere to the clam. then stir the clams around to ensure they cook evenly. use your head and don’t splatter hot grease everywhere! cook until golden brown. maybe about 1-2 minutes per batch depending on how many clams you fry in a batch. FOR THE LOVE OF ALL THAT IS GOOD AND HOLY DO NOT OVERCOOK THEM! i was pondering making 1 pound into steamers and 1 pound into fried clams but i ended up making all two pounds nito fried clams because i had such a strong hankering for them. and, holy cow, am i glad i did. seriously, i have never had fried clams this good outside of maine. and i dare say i’ve only had clams this good in a few rare spots on the coast. tender, light and minimal. not too heavy at all and the clam flavor really burts through. especially when you break open the stomach between your teeth! Previous PostScenes from The Best Birthday. or how to have a great time in madison wisconsin.Next Postday 3250: empirically testing the physics of freefall and drag. Sounds like an awesome birthday tradition!